Play therapy is a form of therapy that is usually performed for the children to help them express, learn and communicate with the environment and with people. It is also a form of counselling or psychotherapy that uses play to communicate with and help people to prevent or resolve psycho-social challenges. Children grow by learning from play. Play has been used in treating or rehabilitation of various neurodevelopmental disorders of children like cerebral palsy, autism and cognitive disorders. Though it was developed in 1920s basically for treating children but it can also be performed for the adults. "Play is part and parcel human experience, it's absence signals lesser quality of life" (Kielhofner & Mikaye, 1981, p.375). Researches have shown the effectiveness of play therapy as a valid therapeautic technique in adults and the elderly people (of all ages). Play encourages the children or adults to move thereby increasing their body function and functional abilities. Play therapy can be performed with an individual adult or in group. When performed in group there is more social interaction and competitive environment that encourages the adults to outstand themselves. Various therapeutic techniques can be implemented during the play. In many countries it is considered to be a certified play therapists for using play therapy like British Association of Play Therapy, Association for Play Therapy. The benefits can be even more based on the goal of the play therapy session. The therapist behaviour should be emapathetic, optimistic, considerate so that the person gets opportunity to express and grow. Play therapy should be performed in a safe environment. There should not be any sharp objects. The activities are designed in such a way that there should not be any strict rule. Individuals getting themselves involved is much more important than getting success. The thoughts and ideas of the participants should be considered. As there are group of differently abled persons with different conditions its natural of feeling lesser than others by an individual. Therapists should make sure that they dont feel abandoned and also the session should help the participants in boosting confidence and their self-esteem. Breaks should be given as and when required to provide their own space and freedom. Safety measures should be made like having the first-aid kit handy, giving assistance to the person whenever required. The therapist should be able to build a competitive environment and enthusiasm in all the individuals throughout the activities. Therapist should make sure that there is interaction between the individuals during the activities that helps them to socialise and build relationship. The ultimate goal should be that all the individuals feel joy, happy, enthusiastic and confident during the whole session. The activities of play therapy might be designed involving other treatment modalities to address a variety of health challenges in adults. Determine the group of individuals for whom the play therapy session is going to be planed. Take a note of the conditions, abilities and risk factors of all the individuals. A thorough assessment of all the adult participants is made. A comprehensive geriatric assessment should be made for all the elderly participants prior to planning of activities. The activities are based on the goals of treatment for the individuals. There can be combination of few goals in an activity. The goals made should be functional based on the ICF model. There is no rule for play. The play activities are planned based on the goals of treatment. There can be combination of few goals in an activity like for improving speech, to improve balance and coordination, to improve fine-motor skills. The materials used for the activities is solely based on the activities planned. It can be a small colour pencil to a badminton racket. The outcome of the session depends on the activities planned. As geriatric is a comprehensive condition, the treatment of the challenges faced by the geriatric people require a multidisciplinary approach. Reference to the specific medical professionals need to be made whenever necessary. It is difficult for the elderly people to move to different places for consultations. 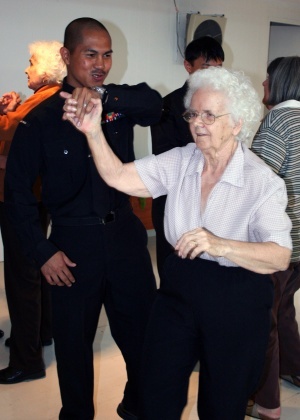 There play therapy is a small step to support in dealing with the challenges faced by the elderly. As the population of the elderly people is growing and there are reports of more number of isolation among the elderly, play therapy plays a small role to help them socialise and improve their health and well being.